A review of Artful Rainwater Design: Creative Ways to Manage Stormwater, by Stuart Echols and Eliza Pennypacker. 2015. ISBN 13: 978-1-61091-266-2 / ISBN 10: 1-61091-266-7. Island Press, Washington. 284 pages. Stormwater is a topic of great interest, especially now that the plight of water has been heightened by environmental pollution, dwindling resources, and growing frequency of severe storm events. What was once considered to be a nuisance or of little consequence has become the focus of city leaders around the world, triggering a call to action to support the better management of the critical, life giving natural resource: water. Artful Rainwater Design: Creative Ways to Manage Stormwater is a timely book that provides insight into the strategies, implementation methods, design parameters, and amenities that creative stormwater design can yield. The discussion of stormwater management has evolved over the past twenties years and with the emergence of Artful Rainwater Design (ARD), a rebranded, specialty focus of stormwater infrastructure, suggests that not only can we achieve improved utilitarian benefits from this form of engineering, but when integrated as a feature design element of open space, can provide an added amenity with a multitude of benefits to the community. To this point, the book looks at these two overarching themes of rainwater design—amenity and utility—as a means to isolate and reflect on the virtues of ARD within both pragmatic and social realms. Separating these two realms thereby allows the audience, whom the authors describe as “rainwater management designers”, to understand the information and become inspired by these implementable solutions, which are illustrated and explained through the collection of built project references. Before diving into particular projects, the authors are careful to define the word ‘amenity’ as well as how it can be understood in context of ARD. For the sake of the book, they note that the definition has two “inherent limitations” based on 1) that attractiveness or value is based on human appreciation (as opposed to “wildlife”) and 2) the measure of attractiveness is based on our understanding of mainstream United States of America’s tastes in landscape beauty. This comment reveals that the target audience is not “rainwater management designers” generally, but those designers specifically practicing in the United States. In this way, the book provokes the question–what are the aesthetic choices and values placed on working in the certain context of the United States vs. other places throughout the world? How do cultural values directly or indirectly identify a ‘sense of water’ through choices of design expression (form, material, texture, color, etc.)? In the case of ‘green infrastructure’, the added layer of plant material, as a designed ecology or part of a larger environmental restoration effort, has the opportunity to portray the intent of ARD and to suggest its belonging to a particular biome (riparian, coastal, wetland, dry wash, etc.) While the book provides a ‘toolkit’ of ideas to achieve amenity and utility driven goals, the challenge relies on the designer to recognize the importance of choosing the appropriate design solution and plant material(s) that are compatible with the frequency and volume of stormwater that the system is designed to manage. Additionally, the designer will need to make an aesthetic decision based on the client/owner’s cultural acceptance of ‘landscape’, and within that, the sense of beauty found within landscape which are designed to be ‘natural’ vs. ‘built’. While amenity is framed in a particular way related to ARDs, the more significant value is triggering one’s awareness that the ARD is intended to improve the management of stormwater and potentially create a reference for the user to engage with. The book, which has the look and feel of a textbook (in a helpful reference sense), is divided into four parts—Part 1) History and Background, Part 2) Achieving Amenity, Part 3) Achieving Utility, and Part 4) Case Studies. The projects described in Artful Rainwater Design are repeatedly referred to throughout the various parts of the book, which serves the authors’ purpose: to reveal the multi-beneficial nature of ARD as well as to express how goals and objectives can be met through various stormwater management techniques. Midway through the book, the authors present a means to identify and cross correlate the goals, objectives, and techniques through a diagram (Table 3.1 The complex web of ARD utility goals, objectives, and techniques on page 103) which becomes the basis for explaining the assortment of techniques found in Part Three. I found this diagram to be particularly intriguing; it has the potential to serve as a key organizational feature for the book, suggesting a sense of decision making based on values from both amenities and utilities that the book offers. Part 1: The History of Stormwater Management and Background for Artful Rainwater Design is an important beginning for readers to place stormwater management into a historical context. The authors trace the original aim of stormwater management, which was driven by basic engineering aims (drain water as efficiently as possible; protect from flooding) and narrate how the practice is moving towards a more holistic and less infrastructure-dependent practice. 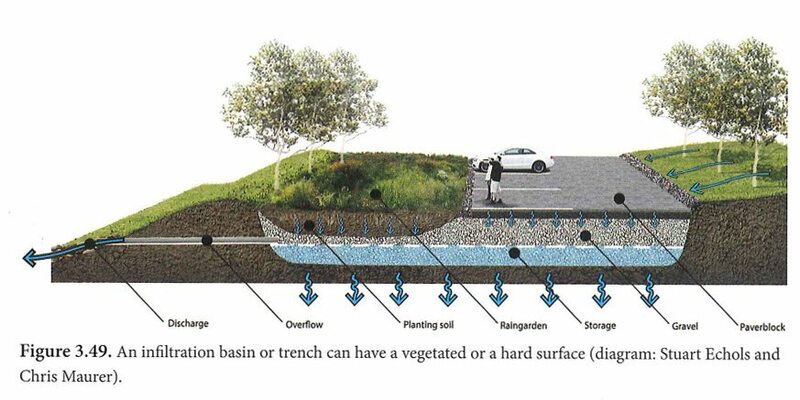 Motivated by early practices of “defensive planning”, stormwater management was formerly considered a means of protection against nature, delineating a defensive boundary to protect from flooding and, as a result, creating a hermetic seal around development. Echols and Pennypacker point to the change in attitude towards stormwater management that was triggered by the environmental movement of the 1960s, and that reached new heights with the release of Rachel Carson’s Silent Spring (1962) and Ian McHarg’s Design with Nature (1969), both of which cast a greater awareness that water quality and environmental pollution were interconnected. The authors explain that this awareness by the science community and federal oversight by the Environmental Protection Agency (EPA), which led to the Clean Water Act in 1972, represented the initial steps to more widespread acknowledgement of and the development of a regulatory framework for non-point pollution. Non-point pollution would become the operative lens through which ARD approaches would unfold—finding a means to “green” more urbanized areas and to capture and treat the “first flush” (or first ½ inch to 1 ½ inches of rainfall) of pollutants before they made their way into the tributary system. With better environmental analysis and understanding of non-point pollution, ‘stormwater management’ came to include quality in addition to (flood) control, necessitating the rethinking of conventional stormwater management systems. 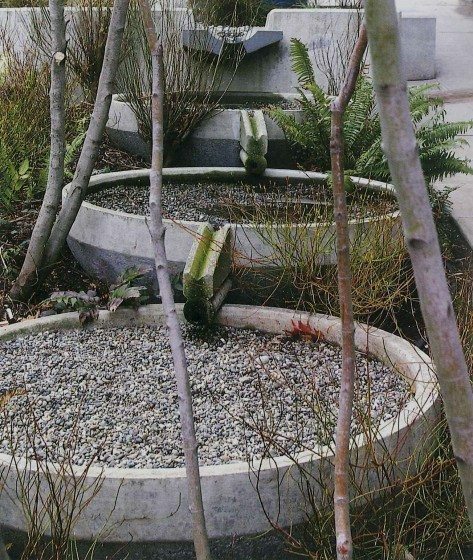 Towards the end of Part 1, the authors indirectly define Artful Rainwater Design (ARD) as a strategy that conceives of “…sustainable stormwater management that is not only visually appealing but also informative about the way it manages rain.” This strategy became a movement in the 1990s as the cities of Portland and Seattle sought to make their stormwater infrastructural systems more adept at achieving higher water quality for the sake of threatened environmental species, as well as to allow people to better understand and appreciate how water is handled in urban and suburban areas. While the word ‘artful’ may be subjective, the term “Artful Rainwater Design” provides a non-technical means of packaging the virtues of this new form of infrastructure, which can bring such amenities as community and social benefits. The term encapsulates the multi-beneficial aspects that Artful Rainwater Design can bring and the ideas it promotes, which readers can explore in their own work. Within Part 2: Achieving Amenity with Artful Rainwater Design, the authors discuss many so-called “amenity” goals found within the practice of landscape design. For the purposes of the book, the goals are specific to the ARD projects featured therein, including: Education, Recreation, Safety, Public Relations (PR), and Aesthetic Richness. Based on these goals, the authors gleaned specific objectives and associated them with the various techniques deployed in the ARD designs. For each goal, the authors provide a table breaking down the various objectives and coupling them with various design techniques, yielding a helpful quick reference for the reader. This design palette of techniques is subsequently translated through the case study projects, which illuminate the possible variation in creating amenities that transcend traditional realms of site design and move into realms of architecture, art, and street design. Part 3: Achieving Utility with Artful Rainwater Design, begins with an overview of utility and how to distinguish stormwater management from stormwater treatment. Treatment is “a subset of management that addresses water quality.” I appreciated the author’s note that “..the utility strategies used in ARD are ones that promote stormwater management that clearly celebrates rain.” This is fundamental to their objective of creating awareness about water as a resource on which we depend; such awareness is greatly needed within our communities, particularly in our more urbanized neighborhoods. I would urge that ARD utility strategies are a celebration of water ; they promote and instill a sense of stewardship and a means of direct/indirect learning about how to support a healthier environment. Part 4: Case Studies of Artful Rainwater Design, the appendix section, provides a helpful profile for each project included in the book. These profiles comprise: the background story (basis for the project, owner/client discussion, funding), both amenity and utility goals are identified as easily readable graphic icons, an in-depth description of both amenity and utility attributes of the project, concluding notes, and the sources for each case study. Information on the project site’s related climate data as well as the construction costs would be greatly appreciated addition for the book’s next edition. As a Southern California native,living with multi-year periods of prolonged drought, I would have found it interesting and beneficial for the authors to have included information on each project’s climate—particularly rainfall—and implementation costs. It is without question that water is everyone’s concern. However, for areas that see very little rainfall whatsoever, it is even more important to illuminate to the public and to convince landowners that every drop of water that lands on a site area needs to be accounted for. Any storm water management design should allow for the value of that water to be maximized. 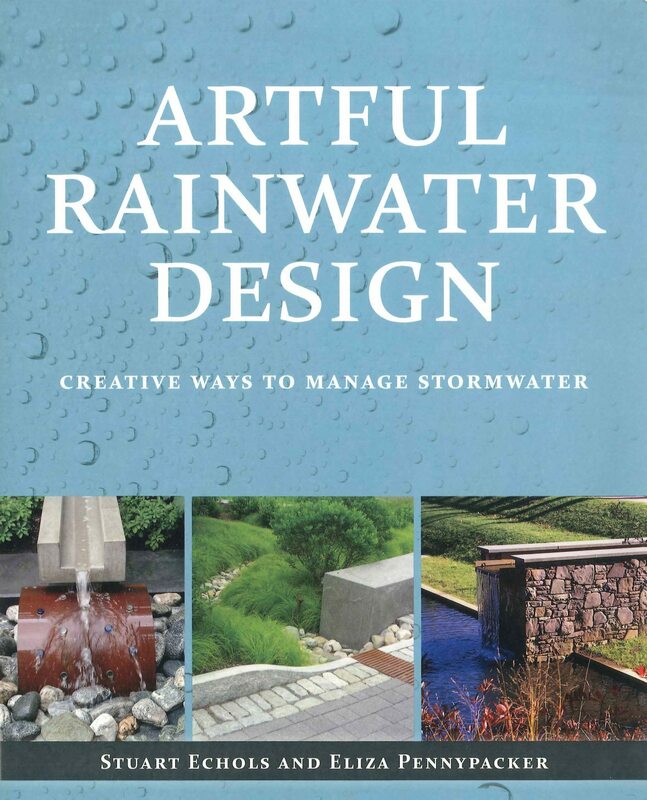 This book achieves its goal—to explain and express the opportunities that are afforded by Artful Rainwater Design. As a landscape architect and urban designer, I hope that the authors return to this topic and take a deeper look at questions that arise in the (professional) industry, including performance metrics, cost-benefit analyses, and challenges placed on these systems over time. As many cities are faced with rising costs for maintenance and capital expenditures, providing both direct and indirect cost benefits (or means of describing these benefits in terms of their monetary value) to the policy makers along with a description of anticipated costs over the life of a project would provide the incentive to include these exciting advancements in stormwater infrastructure early on, enabling more creative design expressions while securing a healthier environment. Overall, this book is a worthwhile read and a useful reference for “rainwater management designers”, including professional (and student) landscape architects, engineers, and architects. I am also hopeful that, given the book’s open-ended title, it will find its way into the hands of policy makers, city managers, and community builders at large here in the U.S.A. and abroad, providing more creative means to achieve a healthier, visually rich, water-responsive landscape. Ben Feldmann, ASLA, is a principal of ML+A, is both landscape architect and urban designer who emphasizes the integration of sustainable methodologies, contextual adaptation, and systems thinking. Thanks for discussing that stormwater management provides benefits as both an amenity and a utility. I’ve been trying to learn more about stormwater systems to work towards implementation in my community. Before now I’d only thought of them as a utility, so I appreciate your discussion of the benefits that may be less obvious. During storms, our house just doesn’t have good drainage and our yard suffers for it. This book sounds like a great read to see what we could do about stormwater. I would love to read the part about how we can pick aesthetic designs to help with it. Thanks for the information.